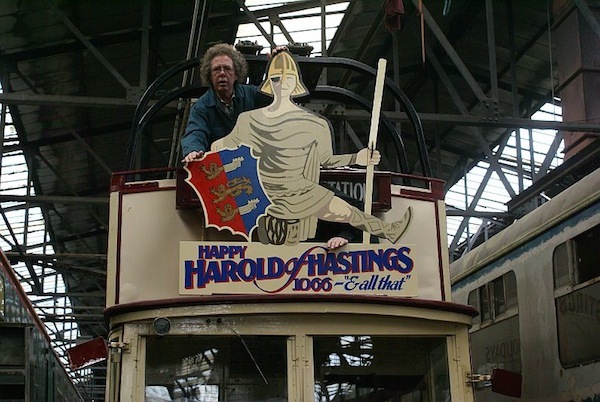 Hastings Online Times – Harold the Hastings Trolleybus will soon be 90! Come and join in the 90th birthday celebrations of ‘Happy Harold’, the only open-top, double-deck trolleybus of his age still alive anywhere in the world! 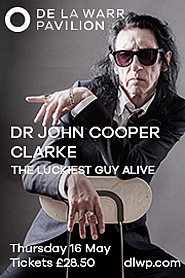 He will have two parties – on 28 March and 1 April. HOT’s Chandra Masoliver explores the life and times of this grand survivor, who has only ever lived in Hastings. On Wednesday 28 March, the ninetieth anniversary of his original registration, Harold will pay a visit to the Silverhill depot, where he started life. At around 11am, hopefully with BBC Southern filming the event, the Mayor and the Deputy Mayor and other lucky people will board her for a trip around town. 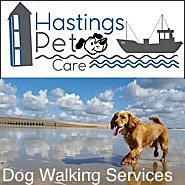 They will travel down London Road to the seafront, turn round at the Fish Market, and drive back along the seafront and up Queens Road. I am told that when he has the good fortune of a following wind, Harold’s top speed can be 19mph. 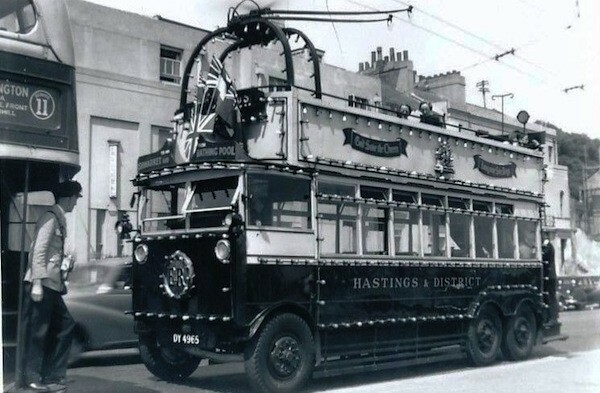 On 1 April 1928, Hastings Trolley bus, Fleet No 3 entered service. 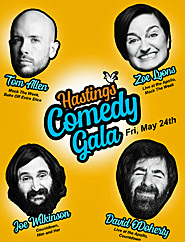 To commemorate this, on Sunday 1 April at about 12 o’clock, Harold will drive up to Hastings Museum where there will be a party for the ninety year old people from Hastings House. 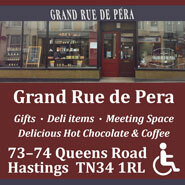 He will be there until 4pm, and after the ninety year olds have had their ride, there will be free rides for all – and everyone is welcome to his tea party, for only £1.00. 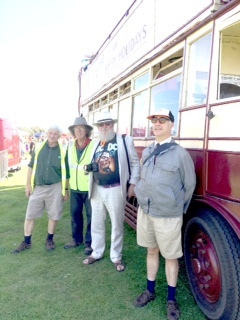 And another celebration on 20 May with the 26th Hastings Trolleybus Restoration Group’s Bus Gathering for classic vehicles at The Oval in Hastings. Admission is free. 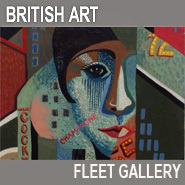 Hastings was a technically avant-garde place in 1928. 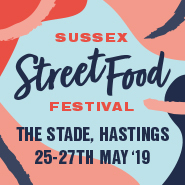 On 1 April, when most towns were still running trams, Hastings replaced theirs, with their worn out tracks all over the roads, with fifty eight trolleybuses. Fifty of these had single decks, built by Ransomes of Ipswich, and eight were double deckers, unique in the world, because they were purpose-built open-toppers. Guy Motors Ltd built their chassis, (all with the same BTX6 three axle chassis, with both rear axles powered – for those who understand the technicalities) and the bodies were built by Christopher Dodson from North London. They ran quietly, on pneumatic tyres. These trolleybuses were well ahead of their time, being powered by an electric motor. The electricity came from two wires suspended above, which carried five hundred volts DC. There were traction poles across their routes, except for Robertson Street, where wires were strung across from buildings. The main seafront route in those days was between the Bathing Pool at Bo Peep, all the way to the turning circle, now the car park at the Blue Dolphin Fish Market in the Old Town. 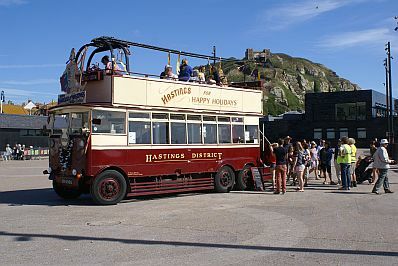 Other routes ran to Cooden Beach; round the Ridge; and from the Victoria Inn at Hollington to Ore.
Those trolleybuses ran in Hastings until 1939/40 when they were replaced with a new fleet of AEC and Sunbeam trolleybuses; most of the single deckers were then sent to Northern towns, and all the double deckers were scrapped. Except for one survivor, registered as DY 4965: this one’s seats were ripped out, and it was used as a works car during the war. Then, after a spell at the back of the Bulverhythe Tram Depot, Hastings Tramways decided to use it for special occasions, starting with the Coronation of Queen Elizabeth in 1953. The seats were restored, coloured lights festooned the outside, it was painted in royal maroon and cream, and he emerged, reborn, as ‘Happy Harold’. Photo by Sue Castro shows the crew, from the left, Bob Hart, conductor and Marshal; Steve Peak, Conductor and Marshal; Ion Castro, chair and driver;William Davies, main driver. In 1960, to help him keep up with Hastings’ frequent and ever-popular parades, Harold was given a Commer TS3 2 stroke diesel engine (with three cylinders and six pistons – two per cylinder). 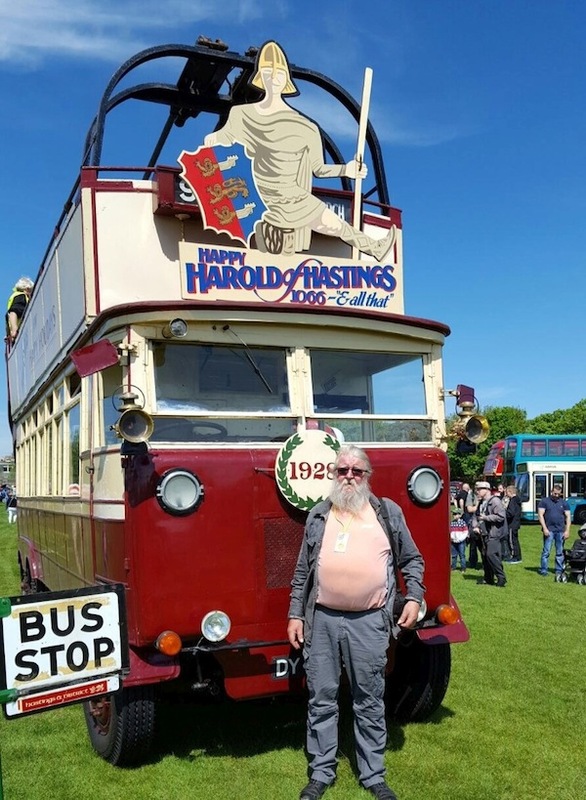 After many ups, downs and near disasters, Hastings Borough Council (HBC) bought him for £1,000 in 1980, then in 1987 the Hastings Trolleybus Restoration Group (HTRG) was formed. After 1,600 hours’ work, assisted by HBC’s direct labour departments, Harold was relaunched in 1989; but even then his problems did not end, so many old-age complaints have troubled him. However, he has been devotedly looked after and kept alive by the ageless and expert ‘boys’ in the HTRG. 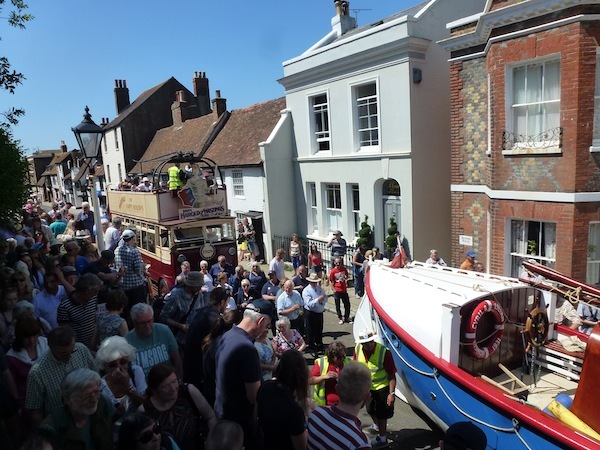 Very appropriately, on Saturday 17 June 2017, Harold accompanied the equally lovingly restored adventuress , Hastings lifeboat ‘Cyril and Lilian Bishop’ (aka The Ghost of Dunkirk) up from the Stade, along All Saint’s Street, to her final resting-place next to All Saints Church. Harold then gallantly took passengers on a roundabout tour back to the Stade. 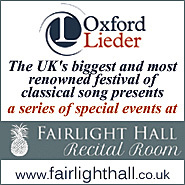 I was there, and he is well worth a ride, so come to this year’s Easter celebrations! For more information about the restoration, check out Hastings Trolleybus Restoration Group and here for a brief history of the trolleybuses in Hastings. Everyone should endeavour to join Happy Harold for his special day!! There is something very special about riding around town in this wonderful old trolley bus – Harold should have his decorative lights restored for his special day – festooned all around!! !